As Hans Zimmer readies a summer Echo Arena date, Getintothis’ Nathan Pang reflects on his productive relationship with filmmaker Christopher Nolan. Solidifying their place in the annals of the great director-composer partnerships in the likes of Spielberg/Williams and Hitchcock/Herrmann, is the sweet synthesis of Hans Zimmer and Christopher Nolan. Like a good marriage, they’ve both tried other suitors but are most at home in each other’s warm embrace. I’ll stop here before this passes the slash fiction line. Known for pioneering the use digital samplers and synthesisers in film, and with a slew of composers now imitating his style, it’s difficult to overstate his influence. The German-born composer began his musical career working with New Wave bands in the 70s and 80s, and partnered with The Buggles to be the first to Kill the Radio Star, playing the keyboard on the first song ever broadcast on MTV. Though it’s now a minor footnote in his career, it could be read as a prophetic inclination of a man ahead of the curve. Hans Zimmer’s European tour will be well underway by the time he arrives in Liverpool in June, and with his next collaboration with Nolan for the soon-to-be multi-Oscar nominated Dunkirk arriving in cinemas soon after, let’s dig into their previous exploits. For Batman Begins, in the first of a seven year trilogy, Nolan cast aside his former partner in crime David Julyan (whom he worked with on Following, Memento and Insomnia) for Hans Zimmer. He worked alongside fellow composer James Newton Howard to re-establish the Caped Crusader on the silver screen. It’s a considerable departure from Danny Elfman’s then-definitive Batman soundtracks, and one they actively avoided looking back on. Gone, are the vast melodic ranges and sprightly energy of the old, and instead we’re welcomed into, quite fittingly, a thunderously grimier and grislier Gotham. In typical Zimmer fashion, it’s stripped back, a tangibly psychological, but relatively simplistic accompaniment that suits Nolan’s version of Batman beautifully, if repetitively. The key track is Molossus (with all the tracks being titled after the Latin names for bat species’), the main action cue in the score. The first of our list that uses the unrelenting force of percussion that Zimmer here first brings into a number of Nolan’s films. The Dark Knight is Heath Ledger’s film. There’s little that one could say about this performance and this character that hasn’t already been expressed in every possible way since the most famous posthumous film release for an actor. But his Joker, the absolute extreme of anarchy and chaos, is also where the Why So Serious? theme masterfully kicks off nine minutes of The Dark Knight soundtrack in as good a fashion as the opening scene itself. It’s bombastic, unpredictable, and unnerving. Sound familiar? Again working with Howard on the film, Zimmer mentions in an interview that the duel nature of Bruce Wayne/Batman fitted a duel composition. And for that, his penchant for the darker extremes means that he was in his element when he led the scoring of The Joker. The clashing of those two cello notes, combined with a whole landscape of distorted textures and unidentifiable sounds makes for just another reason why this villain is so effective, in every sense. With more experimental freedom this time round, the rest of the soundtrack still finds a balance in Zimmer’s hair-raising action beats with Like a Dog Chasing Cars, and Howard’s emotionally swelling strings in Harvey Two-Face. Though it featured a few highlights, their Batman Begins soundtrack is comparatively restrained compared to the follow up. Like Nolan himself, Zimmer used the sophomore entry to push the extremes. It’s a smart move, while riding the critical wave of The Dark Knight, that Nolan and co. sidestepped the impossible task of making a satisfying final instalment, and made his little indie passion project of Inception. Now without the counterweight of James Newton Howard in the fold, Zimmer is left to his own devices from hereon in. His soundtrack goes from the grand expanses of Dream is Collapsing to the machine-gun percussion heavy Mombasa. Then we have Time. There are few outright melodies in Zimmer’s scores. He doesn’t write songs to picture, he writes soundscapes to themes. Consequently there is a simplicity and minimalism to his work, conveying the emotion and power through the scale and energy of his sounds. The closest we get to a melody is here, in the beautifully orchestrated Time, where a motif from Half Remembered Dream becomes an engrossing four and a half minutes during the closing minutes of the film. It’s a testament to their partnership that Zimmer’s most well-known music is arguably not the Oscar and Bafta winning score for The Lion King (showtunes notwithstanding) but from his Nolan films. Although, to be honest, it’s probably specifically that virally spreading Inception BWORM. Is bworm the correct onomatopoeia? Bwong? Bramm? Ka-pow? You know the one. Also Johnny Marr of The Smiths played in this score. There’s your fact of the day. Inception was a welcome breath of creative fresh air for Zimmer. Now in the last of the Batman trilogy, it has to be said that The Dark Knight Rises plays like an hour long reprise of his earlier work, a musician stuck in his comfort zone. There are some interesting additions to the trilogy, such as the militaristic chants in Gotham’s Reckoning, but the score is relegated mostly to quite a monotonous underscore. But nevertheless, he provides some long-awaited closure, in Rise. A track in thirds, it moves from his Batman theme, to some solemnly romantic strings, and finally “rising” into the film’s finale, bringing the two-note Batman leitmotif to a climax. Zimmer has often spoke of the importance in his role to serve the story, and write music within, rather than above it. This is the first of the scores here that really needs the contextual narrative around it to give it some heft. It’s a minor criticism though, as I still remember seeing this in cinemas and feeling very distinctly the satisfying closing bars playing while Joseph Gordon-Levitt rises in the Batcave. So I watched Interstellar this past week. I’d like to illustrate my review of the film with a single Inception BWONG. It’s a country-mile from the Batman roots of their partnership, the sound of Interstellar was brand new, and brilliant. Instead of slamming on those action drums, with furiously rhythmic strings to heighten tension, the grandeur of the church organ is quite the revelation. The pipes feel intimate and endlessly vast at the same time, and their permeation throughout the score gives it a truly coherent continuity that few of his scores have managed before. Among others, Stay is a perfect example of how Zimmer embraces the emotional subtleties inspired by the movie to create the enormous sounds that are designed to envelop. Written before and during the writing and production of the film, there are few projects that seem to grow so symbiotically. The score reportedly spawns from Nolan tasking Zimmer to write something about his experiences of fatherhood, with no prior knowledge of film’s the expansive sci-fi nature. It’s a funny experiment that pays off in one of their most emotionally grounded scores, and due to their concurrent productions, one that’s magnetically (or gravitationally) in tune with Chris’ visuals. This is a rare partnership in which both parties raise their game to elevate their counterpart’s works. Now that Brad and Angelina have split, it’s time to make way for the real power couple of Hollywood. After breaking the rules of science fiction scoring for Interstellar, it’s difficult to anticipate what he’ll do for Dunkirk. We’ve heard glimpses in the teaser and trailer, but working again with Nolan, is he about to redefine the sound of the war film? 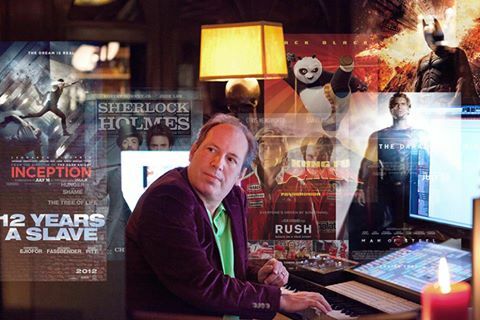 Let’s not forget that I’ve focused on his work with a single director, Hans Zimmer also scored the Oscar winning classics of Gladiator, Rain Man, Driving Miss Daisy and The Lion King to name a few, which his live show is not going to overlook. He will be at the Liverpool Echo Arena on June 17 though unfortunately, it’s pretty unlikely Chris Nolan will turn up for a jam.